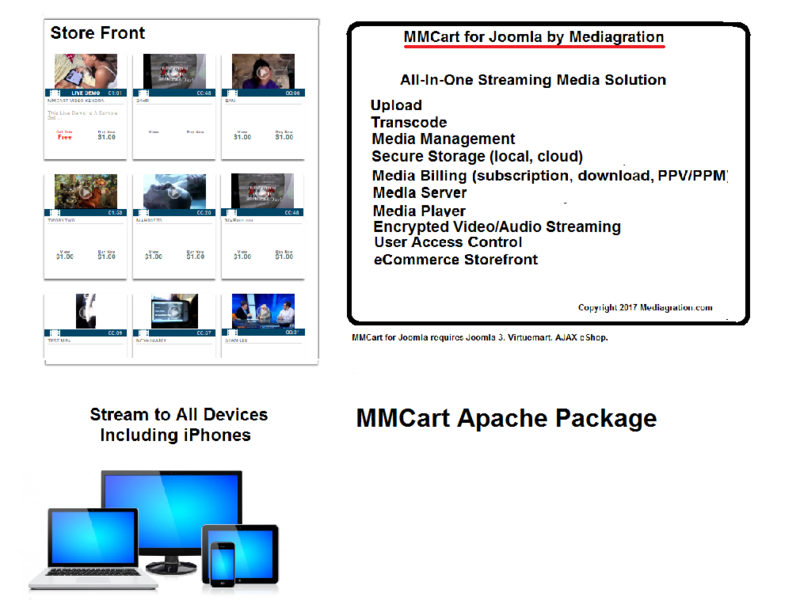 With our basic MMCart Apache Package, we include all software and scripts necessary to set up a complete subscription/pay per view streaming media publishing site, supporting upload, transcoding, and sell streaming video from a single server platform; a single Apache server can host all the necessary components for streaming HLSe video and audio. When you purchase an installation package from Mediagration, we'll install the latest versions of all the above software, most of which is free and Open Source. It should be noted, that MMCart for Joomla can use either native or third-party transcoding services and CDNs. Because there are no recurring costs associated with any of the above software, the MMCart Apache Package offers a significant advantage when compared to other solutions, when it comes to setup and operational costs.